Coastal fatality figures released today by the RNLI show 31 people lost their lives around the north of England coasts last year – but 61 per cent didn’t even set out to enter the water. The number of near-misses was even higher, with the RNLI’s lifeboat crews and lifeguards in the north of England saving 89 lives in 2014. The figures are revealed as the RNLI launches its 2015 national drowning prevention campaign, Respect the Water, warning people that our coastlines and waters can be dangerously unpredictable. The charity is releasing two hard-hitting campaign films, which will be shown in cinemas across the UK and Ireland from tomorrow. The five-year figures show an average of 24 people die around the north England coasts each year. Of the 121 people who died over the past five years, over half were taking part in activities like walking, running, climbing and boating and were, therefore, unlikely to have intended to enter the water. Slips and falls while walking and running contributed to the most coastal deaths in the region, accounting for 31 per cent. Swimming, jumping in and general leisure use accounted for 14 per cent of coastal fatalities over the five years; commercial activity nine per cent and angling, seven per cent. Men are far more prone to getting into danger at the coast than women. Over two-thirds of the deaths over the five-year period were men. The RNLI is aiming to halve the number of coastal deaths by 2024. The charity’s national drowning prevention campaign, Respect the Water, is this year warning people – particularly adult men – to be aware of the dangers of the coastline, as well as the water itself. 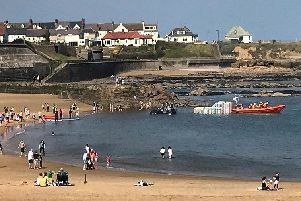 Michael Avril, RNLI Community Incident Reduction Manager for the north of England, said: “Most people heading for a stroll or run along the coastline probably wouldn’t consider a drowning prevention campaign like this relevant to them as they have no plans at all to enter the water.